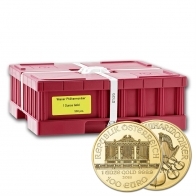 Beautiful Austrian Philharmonic gold coins. 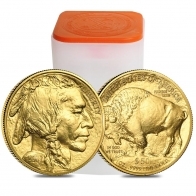 Brand new, 2019 uncirculated 1/4 ounce (oz) gold bullion coins. 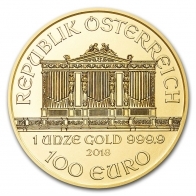 Each coin features the image of the Great Organ of the Golden Hall in Vienna's Musikverein on the front, with an array of instruments on the back. The front of the coin depicts the weight, fineness, year and face value of the Philharonic gold coin. 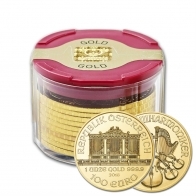 Each coin has a face value of 25 Euros, and consists of 9999 fine investment grade gold bullion. The Philharmonic is available in 1/10 Oz, 1/4 Oz, 1/2 Oz and 1 Oz sizes in Gold, and is available in silver and platinum in the 1 oz size.